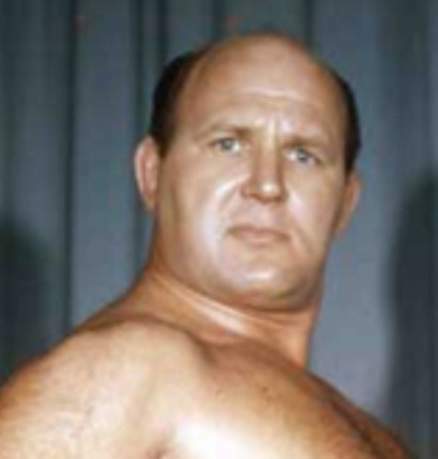 Don Stansauk was an ex-pro football player who became an actor after his wrestling days..
~~~~He appeared in Dirty Harry, Paint Your Wagon, Mickey & Maude and The Muppet Movie.. 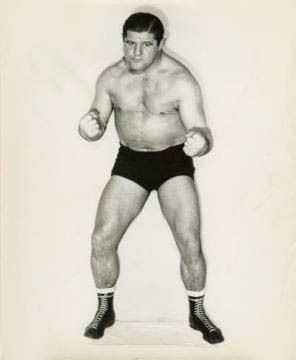 It was the late (promoter) Wally Karbo, that dubbed Don Stansauk as “Hard Boiled Haggerty”..
Hard Boiled Haggerty was a solid main eventer in the upper Midwest and in California and Hawaii..
September 1960: Hard Boiled Haggerty defeated Gene Kiniski for the AWA United States Heavyweight title..
October 4, 1960: Hard Boiled Haggerty & Len Montana beat Tiny Mills & Stan Kowalski to win the AWA Tag Team titles..
October 17, 1960: Mister M (Bill Miller) defeated Hard Boiled Haggerty for the AWA United States Heavyweight title..
March 18, 1961: Hard Boiled Haggerty chose Gene Kiniski as his partner after Len Montana broke his leg during their reign as champions..
May 23, 1961: Wilbur Snyder & Leo Nomellini beat Hard Boiled Haggerty & Gene Kiniski to capture the AWA Tag Team titles..
July 19, 1961: Hard Boiled Haggerty & Gene Kiniski beat Wilbur Snyder & Leo Nomellini for the AWA World tag team titles..
~~~Hard Boiled Haggerty & Gene Kiniski split up and had a match to determine who would keep the Tag Team belts..
~~~Hard Boiled Haggerty defeated Gene Kiniski and chose Bob Geigel as his partner..
June 20, 2003: Don “Hard Boiled” Haggerty was in a car accident in Los Angeles and suffered a broken neck and other injuries..
January 27, 2004: Don “Hard Boiled Haggerty passed away at the at of 78 at his home in Malibu, California..
“Irish” Pat McClarty used the “Hard Boiled Haggerty” name in California in 1939..
Benny Rosen and Lou Reyhneer also used the “Hard Boiled Haggerty” name during their career.. 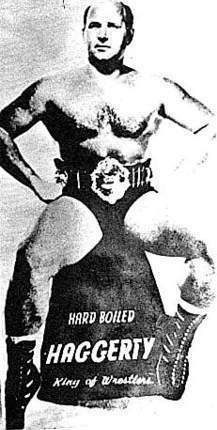 There was another wrestler named Babe Sharkey who had the similar handle, Hard Boiled HANNIGAN..